Raise your hand if you’re old enough to remember the Apple that used to tout this motto in the picture above. Been a long time since then, hasn’t it? Well, companies change. After all, Coke used to have actual cocaine in it. Over the years, Apple has gone from the people’s computer to somewhat of a luxury brand. The advent of the new Apple Watch seemingly solidified Apple’s place in people’s eyes (and their wrist) as a company catering to the 1 percent. Starting at an already hefty $349, the watch must be paired with an iPhone 5 and up, running the latest iOS 8. While technically you could get a “free” iPhone 5c by locking yourself into a carrier contact that subsidizes the phone, the reality is that Apple Watch users will be paying for two expensive pieces of hardware for one to fully function. It’s the same Apple story. Nothing to see here. 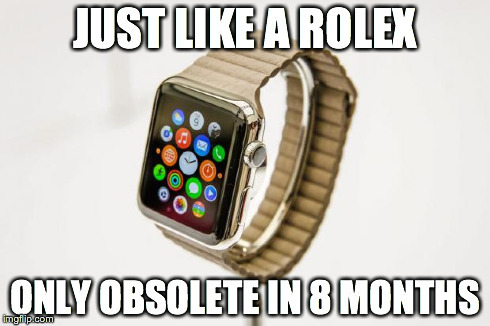 Despite all the fun memes that are already popping up poking fun at the supposed absurdity of wearing gear destined for obsolescence in a few years, the Apple Watch isn’t anything different from the debut of the iPhone. The first review on Engadget worried about the “steep price of admission” and signing a 2-year contract with AT&T. Gizmodo suggested everyone wait to buy until an updated version comes out. Don’t forget, the first iPhones were $499 and $599 upon release before a big price cut shortly thereafter. And those were 2007 dollars. But the original iPhone sold like gangbusters because it was an incredible device and early adopters (the number of which surprised everyone) gave such great word-of-mouth reviews. It was a luxury item, but there was a market for it, and Apple learned that people were willing to not only shell out the bucks to be the first ones holding their gear, but take pride in being pioneers in a new wave of technology. Call it the “Cult of Apple,” but it’s just brand loyalty at its finest. With the Apple Watch, Apple is just running with a formula that has worked for them with the iPod, iPhone, and iPad. Namely, release a good product as a luxury item, then iterate and scale back costs to eventually make it affordable to everyone. Would anyone consider an iPod or iPhone luxury items anymore? Not really, since you can get a Shuffle for $49 and an iPhone for free. Only the iPad may still be considered a luxury item, but an iPad mini is a decent bargain at $249 with all it can do as a personal computer. So jump three years from now and we’ll be looking back and scoffing about the Apple Watch’s high initial price while $99 models are rolled out. It’s inevitable if you look at Apple’s history. Changing customer behavior, once again. The real question is whether Apple can, yet again, convince people to change their consumption behavior. Before the iPhone, cell phones were less disposable. Remember, the best selling cell phone before the iPhone was the Motorola RAZR, which was the top model for five years without any radical redesigns. While the actual lifecycle of a RAZR and an iPhone may be comparable, iOS upgrades and new models started coming every 6-9 months which eventually changed consumer behavior from holding onto a phone for a number of years, to upgrading hardware almost annually. Apple changed how people buy cell phones. Today, it’s odd to think about replacing a wristwatch every few years. Even on the low end, watches last a decade and often it’s just the battery that needs replacing. Can Apple change customer behavior again, convincing people to upgrade technology that we’re not accustomed to upgrading? 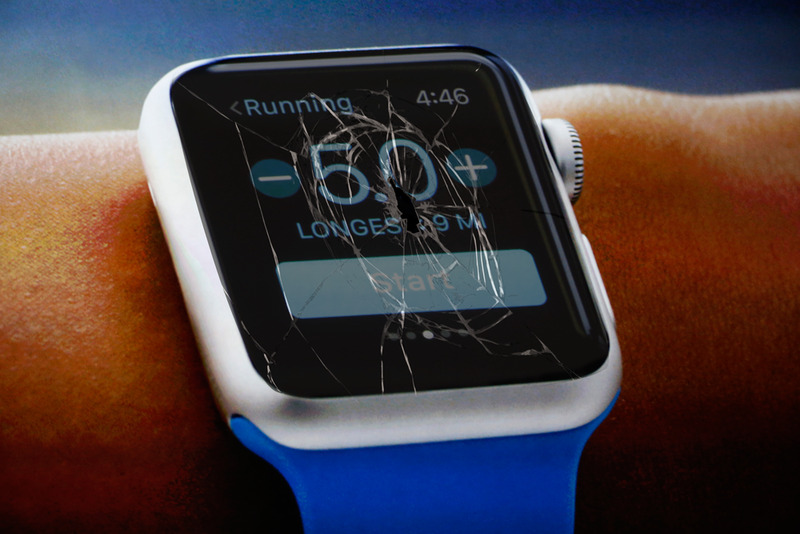 It remains to be seen, and it’s the most important question to ask in the conversation of whether Apple Watches can sustain itself as anything other than a niche luxury item. Even if prices come down to $99 a pop, will people be willing to upgrade every couple years? Apple is betting that they will. Fortunately for them, they’ve been right about this many times already.